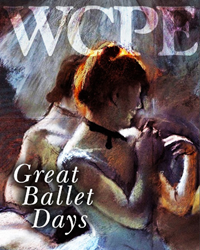 WCPE’s Music Director William Woltz announces a celebration of Great Ballet Music, September 15-18, 2016. Curl up in a comfy chair or slip on your own dancing shoes. “Curl up in a comfy chair or slip on your own dancing shoes,” concludes Woltz. On Saturday you may request your favorites at the Saturday Evening Request Program. With a 38 plus year history, WCPE 89.7 FM is a non-commercial, 100 percent listener-supported, independent station dedicated to excellence in Great Classical Music broadcasting. Community-minded business underwriters and foundations are among the 150,000 listeners in the North Carolina broadcast area. General Manager Deborah S. Proctor’s leadership has enabled the WCPE community to include national and worldwide listeners. Big and small dish home satellite transmissions serve North America. Other radio stations and cable television systems use these services to rebroadcast Great Classical Music, 24 Hours A Day. WCPE is one of the first public broadcasters to stream on the Internet. WCPE is heard worldwide on the Internet in multiple formats, including the next generation IPv6. Because WCPE receives no tax-derived support, the station conducts two on-air fundraising campaigns and two major mail-out campaigns per year to raise needed operating funds. For more information, visit http://www.TheClassicalStation.org or call 919-556-5178.